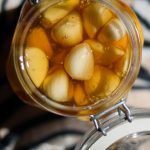 Fermented Honey Garlic is incredibly versatile, easily making any dish more exciting – meats and vegetables, as a dip or a marinade. Simple. Holley made this one, but I wanted to chat today. Teamwork. I don't typically pay that close attention to the news in general. Not because I don't care about what's going on or that it's not interesting, because neither are true. It's just too much of a this-is-what-is-totally-screwed-up-with-the-world, focus-on-the-negative, list of things that make me frustrated and sad. I do care, maybe too much. And I do find everything interesting. But I find that it can really take a lot out of me. I'll be honest: I don't really get what's happening in Syria and the more I ask people about it, the less I understand why a) there are so many problems there and b) why nobody is doing anything to help. Anyway, the other day I was listening to CBC Radio's “Q”, about Amnesty International's digital recreation of Syria's Saydnaya torture prison. It was amazing how they recreated the sounds based on former detainees, while soul-crushing to hear about their experiences. Yesterday I finally took a look at the Amnesty International website. and listened to the interviews and recreated sound-experience for about half an hour. To say that it is brutal is a severe understatement. I can't believe that real people are being treated like that, or that it is real people who are causing this torture. How was I supposed to deal with my own problems after listening to this? I felt bad for feeling bad about the frustrations in my life. I was mentally and emotionally drained after listening to these men who had survived. What is wrong with people?! How can we treat each other so poorly?? I felt ashamed of human-kind. Slowly the words started to penetrate my mind… whoa. At the same time I realized that I didn't know this person. “Thank you! You too,” I managed. “OK, bye!” he said. That call completely changed my day. It brought the smile back to my face. It is amazing how such a seemingly small gesture could impact me so much. I was brought back into a place of wanting to brighten peoples' days. I told a couple people about the call. Had some good talks about how the Universe can show you love when you need it. I needed to pay this forward. I dialed a random number. Out of service. Attempt number two: a middle-aged woman answered. I repeated Ethan's message. She kind of chuckled, a little uncomfortable. I could feel the words percolating in her head and when I said goodbye I could tell that she wanted to ask the same questions I had had. But it was too late: I was gone. You are. I believe that, and want you to too. I'm not asking you to make a call like that. But maybe you should. It's amazing the impact the love of a stranger can have. I just watched the Tony Robbins: I'm Not Your Guru on Netflix last night and it was one of the big take-aways that I was left contemplating. I think it's obvious that I want to share love through food. If I didn't, The Primal Desire wouldn't exist. I'm glad that you're here right now and I hope that you are sharing love inspired by our recipes. 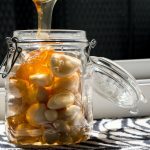 You couldn't ask for an easier way than using Holley's Fermented Honey Garlic. It's seriously good (look forward to her Honey Garlic Chicken soon! ), easy, and beautiful. 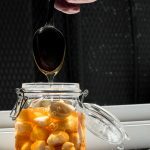 The hardest part of this recipe is waiting for those delicious cloves to ferment in that golden honey! 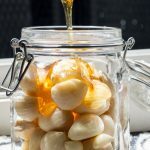 In a clean dry jar, place the garlic cloves, you want to leave a little room at the top. Pour the honey into the jar coving the cloves but again making sure there is some space at the top. 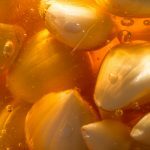 As the garlic ferments in the honey, it can bubble up. 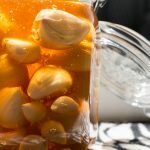 Make sure the garlic cloves stay covered with honey, and that you regularly “burp” the lid of the fido jar or covering. Let sit for 4 weeks, or 28 days. The garlic will darken, and the honey slightly more liquid, and then you know it is ready! 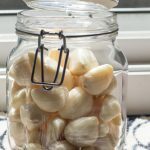 Once fermented, you can pop that raw garlic in your mouth, it's delicious and sweet. Or add the raw honey to lemon tea to boost your immune system, or soothe a sore throat. Well written, Raj! Isn’t it interesting how that call came in on the day you had been feeling down? I’m sorry, Suse, that is super annoying. Were you on a mobile device, tablet or PC just out of curiosity? How do I burp the jar ? That depends on the type of jar you have! A fido jar or a flip top for example, apply pressure to the top and undo to latch, allowing some air to escape. A screw top – unscrew you will hear the air escape. I have heard that the pressure can build and break the jar, but I have never personally experienced it. 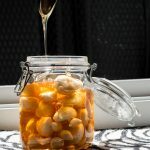 I made a screw top jar yesterday but the garlic keep coming up on top and just “footing ” on the top of the honey ……also do i have to wait a whole month or can i just start eating the garlic like after a week ? That depends, a strong scent of garlic would be perfectly normal. My batches got quite dark in color in comparison of the regular raw honey. And smelled strongly of garlic. What of the cloves turn green? Like a brown-green hue? or a bright blue-green? It looks like you used mature garlic. “According to chemists at the China Agricultural University in Beijing, aging the garlic gives it a chance to accumulate large quantities of one of the chemicals that generate the color; fresh garlic doesn’t green much at all. And a strong green color develops in Laba garlic only with acetic acid, the main acid in vinegar (also found in sourdough), because it’s especially effective at breaching internal membranes and mixing the cell chemicals that react together to create the green pigment. The pigment itself turns out to be a close chemical relative of chlorophyll, which gives all green leaves their color.” Unless it is green and fuzzy? 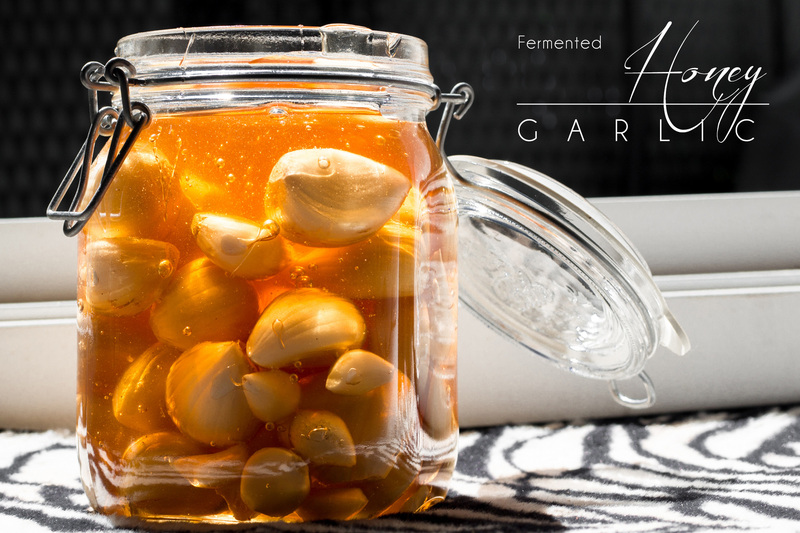 Can you reuse the leftover honey to start a new batch of fermented garlic & honey? Hello! Sorry for the delay, you could add more garlic AND more honey to the pot. Honey on its own is too acidic to ferment, the garlic changes the PH and then fermentation occurs. Really this is a call you will have to make for your self. If you have a weakened or compromised immune system, or if your garlic is at all degraded, I would be hesitant. 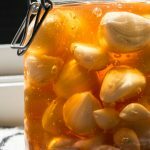 I add more garlic and honey to my existing pot, but with all ferments, there is a risk of contamination, and if you end up with mold at any time in the process, compost it! Hmnn. I don’t have an answer for you. Usually, the lids are coated in plastic, so I’m confused. Safety first, but I don’t know what the answer is on this one. Use a glass top container next time?